Busta Rhymes - The Coming. Vinyl LP. Bleep. 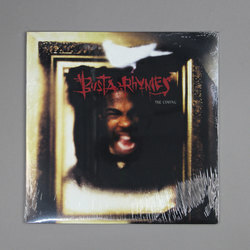 Busta Rhymes delivered his debut album, The Coming, three years after the Leaders of the New School unofficially disbanded. Though his talents were evident on those Leaders of the New School releases, Busta went on a series of features that only built up the public’s desire for a solo Busta album. Right out the gate Busta dropped his classic debut single “Woo Hah! !” that made it abundantly clear he was to be mentioned among Hip Hop’s greatest solo artists. The energy and originality packed on that one song set a tone for the album that displays Busta’s raw talent and ability to bend words with his ever rambunctious flow. Songs such as “Everything Remains Raw”, “Abandon Ship”, and “Still Shining” all rise above as The Coming’s stand out tracks but it’s really “ill Vibe” that is the albums crown jewel moment. Busta sounds right at home over this J Dilla beat trading verses with his Native Tongue cohort Q-Tip. The Coming was a critical and commercial success for Busta Rhymes. It reached #6 on the Billboard 200 chart in 1996 and has since received a platinum certification from RIAA. As mentioned The Coming boasts the hit single "Woo Hah!! Got You All in Check" which reached #8 on the Billboard Hot 100 chart in 1996. It was nominated for a 1997 Grammy Award for Best Rap Solo Performance. It also ended up sporting another hit single, "It's a Party" featuring Zhané. The Coming shows amazing variety where Busta is able to break free from the bells and the whistles of the Busta “Dungeon Dragon” flow to explore other ways of leaving our jaws open by his incredible lyricism. The Coming surely lives up to its title, as Busta delivers a performance that ignited his impeccable solo career.